This week the Tribe of Moles is very pleased to present a guest post by Tony Cox, a Dundee-based activist in the Scottish Unemployed Workers Network. The SUWN are carrying out inspiring frontline advocacy work at jobcentres and disability benefits assessments centres, in defiance of arrests and convictions – on 21 July Dundee Sheriff Court sentenced Tony to 150 hours community service after he was arrested accompanying a vulnerable woman to her Work Capability Assessment. It is often said by activists and campaigners that we stand on the shoulders of giants, a phrase that has especial resonance for those of us within the anti-austerity movement in Dundee, Scotland’s ‘RED YES CITY’. Not only is Dundee a major crucible of the modern Scottish, and British, labour movement, it has also produced outstanding socialists and communists who dared to stand against the tide, and who incurred the wrath of the establishment of their own day. Mary Brooksbank is one such figure, a jute worker and working-class revolutionary who underwent arrest, criminalisation and blacklisting during the inter-war years, and who was expelled from the Communist Party for not towing the party line. Mary was a one woman roving class-war machine, who refused to compromise, and who saw salvation in class struggle, as in the line, ‘a fecht tae mak it a wee bit smoother’. For over two years, the Scottish Unemployed Workers Network (SUWN) have taken these words to heart, and attempted to use this notion of struggle as a form of class therapy in order to challenge the attacks on the ordinary men and women faced with the Kafkaesque horrors of the so-called ‘welfare’ system. It was during the referendum, and its immediate aftermath, that Dundee became known as ‘Scotland’s sanction city’, allowing some to speculate that this was a punishment for the many unemployed people who registered to vote and voted YES. The situation faced by the poorest and most vulnerable was becoming increasingly desperate, with thirty sanctions per day being reported at the height of the sanctions regime. The misery, trauma and pain that this caused for hundreds of our poorest citizens recalled Hugh MacDiarmid’s stinging rebuke to the douce burghers of Dundee in the early 1930s, when he stated that, ‘Dundee is a great industrial cul-de-sac – a grim monument to man’s inhumanity to man.’ (Hugh MacDiarmid, ‘Dundee’, p. 190, in Lewis Grassic Gibbon and Hugh MacDiarmid, Scottish Scene, London, 1934, pp. 189-94.) With foodbank providers reporting a massive surge in demand, and with our direct experience of the chaos that was being caused by the spiralling sanction rate, the major question we were faced with at this time was how we could first reduce and then eradicate this example of state-sponsored starvation. We had received a massive fillip during the summer of Indy, and following the referendum we found increasing numbers of volunteers coming forward from the Indy movement to fight against welfare ‘reform’. With fresh resources and new blood in our ranks, we were able to construct a pattern of work that mixed front-line advocacy, campaigning, research and direct action. We continued with street meetings, alongside foodbank collections, and appealed to Dundee’s citizens to help the sanctioned through the notion of social and class solidarity and not through charity. We tied this to the need to bring about political change in order to end British state-sponsored starvation, demanding the devolution of ALL welfare powers to the Scottish Government. In addition to helping with direct food collection, we embarked on an ambitious research program that aimed to reveal the horrors of the sanctions regime, conducting interviews with eighty-six people who had been sanctioned. This was published and widely distributed under the title, ‘Sanctioned Voices’. We also developed our methods of front-line advocacy through direct experience of working outside Dundee Jobcentre. By late 2014, as autumn rains gave way to winter snows, we had established a system of working that was bringing about concrete results. We had spent months talking to the people we met outside the jobcentre, and fed this intelligence into our ‘Know Your Rights’ leaflets. We figured that, as a relatively small group with finite resources, we could not, and should not, attempt to replicate the work of the established welfare organisations in the city. Our job was to reach those that the office-based organisations could not reach – our aim being to ensure that these people were able to represent themselves rather than relying on the help of their ‘betters’, including ourselves. >>> Thousands of ‘Know Your Rights’ leaflets were distributed at dozens of advice stalls over the freezing winter of 2014-15, and dozens of cases were directly taken up by us. Our method of working was simple; two volunteers would station themselves on each side of the jobcentre entrance in order to ensure that everyone going into the buroo was handed a ‘Know Your Rights’ leaflet, and everyone who was leaving was asked by a third volunteer, who was stationed directly outside the entrance, whether they were experiencing any problems. We also had volunteers leafleting passers-by and manning the advice stall, which was kept supplied with further advice leaflets along with our bible, the Child Poverty Action Group (CPAG) Handbook. At the height of the sanctions regime, we were often dealing with five or six cases a day. This often involved volunteers accompanying unemployed people into the buroo to clarify their situation and to support them in negotiations with their ‘job coaches’ (sic), whilst other volunteers accompanied unemployed people to the welfare rights office to introduce them, and the their cases, to the full-time welfare workers. In this way, more of our volunteers were getting direct hands-on experience of front-line advocacy, learning what the main reasons were for sanctions, and looking for the most effective way these sanctions could be challenged. We never lost sight of the primary need to support the unemployed to represent themselves through making sure they were aware of their rights, and re-instilling in them a confidence to challenge the ‘job coaches’ and ‘decision makers’ by pointing to the support they could count on from ourselves. We also noticed, as word spread of our activities (not least through jobcentre staff themselves who would often go out of their way to decry us to their ‘clients’ as a ‘political mob’ with no interest in helping people), that increasing numbers of curious fowk started to congregate around our stalls to share news, get advice, bring us stories and cases, and to generally chill out. And we heard from increasing numbers of people that the presence of our stalls was acting as a check on sanctioning activity, and that the jobcentre staff were far more pleasant with them when we were outside and, particularly, inside, the jobcentre. We took our methods and stalls to Govan and to Paisley, though our centre of activity remained Dundee. By the spring of 2015, we received proof that our methods were working when it was announced by the DWP that there had been no less than a 40% fall in sanction rates in Dundee compared with the previous quarterly figures. We could not, though, rest on our laurels, as, whilst the sanction rate had reduced, we were now encountering many cases of people having their right to Employment and Support Allowance (ESA) removed, as well as increasing numbers of people who were being forced into various unpaid ‘workfare’ schemes. The work of front-line advocacy continued, and by the early part of 2016, we were receiving reports that a team of council welfare-rights workers was to be established within Dundee jobcentre. We were delighted with this new development as it not only removed a lot of pressure from our increasingly hard-pressed volunteers, who were struggling to deal with mounting case loads, but it also confirmed that our work was having a direct impact on local DWP policy. By accepting a welfare-rights presence in the jobcentre, local DWP managers were effectively attempting to ‘drain the well’ of the kind of cases that we were bringing to the attention of a growing audience through our online reports, which were also being taken up by the local, and national, mainstream media. >>> We did, though, encounter greater and greater levels of hostility from jobcentre security and staff. In January 2015 I was arrested at Arbroath jobcentre on a charge of ‘threatening behaviour’ whilst representing a vulnerable woman, and we also had the police called on us on a number of other occasions when we sought to challenge the actions or decisions of jobcentre and assessment centre staff, though without the police actually arresting anyone. Many months later, at Forfar Sheriff court, the substantive charge against me as dropped, though I was found guilty of not giving my name to the police – yes, that is a criminal offence. But, before this had happened, I was arrested again, in November 2015, this time at the Maximus ESA assessment centre. I was recently found guilty of ‘threatening behaviour’ arising from this case – a verdict the sheriff justified on the ground that he ‘preferred’ the evidence of the Crown to that of the defence, including the evidence of the woman I accompanied in to assessment, who was firm in her insistence that I did not swear, abuse, threaten or shove anyone, as alleged by the Maximus employees. I was sentenced to a hundred and fifty hours of community service, showing that, whilst the sheriff may have had a skewed notion of justice, he did not lack a sense of irony. Indeed, I was relieved that this ‘hooded craw’ did not have even more drastic punishments at his disposal, otherwise I might have been faced with a black cap and an ominously sombre look when I appeared for sentencing. 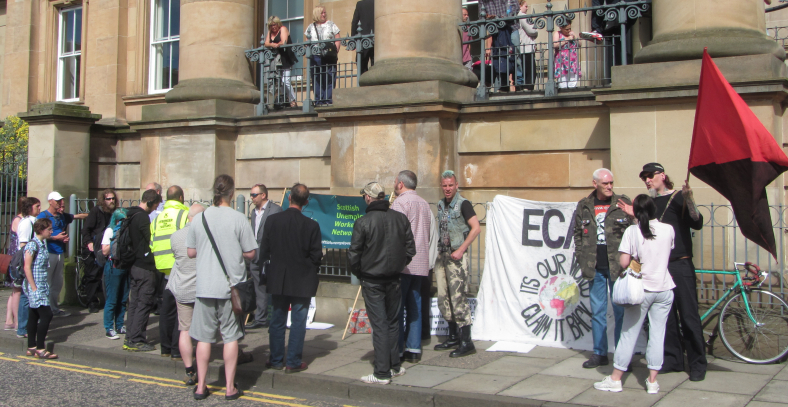 >>> Since the trial and verdict we have continued with front-line advocacy, a method of welfare work that is attracting wider attention from other anti-austerity and welfare-activist groups, including Edinburgh Coalition Against Poverty (ECAP), Castlemilk Against Austerity (CAA) and the London-based Boycott Workfare. We are confident that front-line advocacy is the way forward for the growing anti-austerity movement. It may put activists in the direct line of fire, but, if this movement grows, that will offer much greater protection from harassment and spurious allegations than any class-ridden so-called ‘justice system’ ever could. We should remember that, whilst we have not asked for this battle, the struggle, once joined, can act as an agent of transformation for both old and new activists and for the unemployed themselves – who are often the same people. It can induce confidence in place of isolation, and optimism in place of hopelessness, and it can transform the balance of power in relations between the unemployed and the DWP, and between the governors and the governed. The appetite increases with the eating, and once people have recognised the extent of their power and the limitations of those that oppress them, then the stage is set for radical change. Whilst we in the SUWN in Dundee have been on a fairly steep learning curve, particularly with regards to the highly politicised policing methods we are faced with, the deepening struggle has also forced us to look outwards, beyond the reaches of the city boundaries, in order to forge links with like-minded activists and groups. We have been stunned and delighted by the solidarity actions organised in defence of our right to advocate by welfare groups across the (dis)United Kingdom. We have made new friends and comrades, who have added to our pool of knowledge and expertise. Taken together, we are not yet a movement, but our developing network of groups and activists contains within itself the promise of future, and potentially spectacular, success and growth. The issue of welfare reform will be with us for some time yet – it presents us with a clear issue for our campaigning and direct action methods, and with a focus for the building of a broad and united anti-austerity fighting front. We believe the elite arrogance and complacency of the Tories has encouraged them to bit off more than they can chew in their continuing attempt to transform the welfare state into a surveillance and control state. It is our duty, and that of the of the wider left and trade union movement, to use the developing war over the very concept of the ‘decent society’ as a platform for further and much more radical social and political change. We are encouraged that fighting Austerity and welfare ‘reform’ has always had a central place in the Independence campaign, and we call on the wider Indy movement to mobilise more strongly and concretely over these issues; after all, what is the point of a Scottish government if it cannot protect the interests of the poorest and most vulnerable within our society? Our aim should be the winning of an independent Scotland that will consign the welfare ‘reform’s to the flames of hell where they belong, and which will create a society that can become the ‘threat of a good example’ to the neoliberal order across all of these islands, and much further afield. I could with some arguments to defeat the anecdotal theories of £50000 a year claimants and food banks full of foreign shopkeepers filling their boots. These points are common in Clydebank. Surely you need to have a referral from social work or similar safeguard before using a foodbank. I started off thinking ‘this is terrific stuff’ – and it is. But (you knew that was coming eh?) it’s only half terrific. All the way through, the assessment staff, and towards the end the police, are ‘othered’ – presented as the enemy. Much whooping in private jets and ocean going ‘yachts’ about how easy it is to set one lot of the ‘lower orders’ one against the other. Here’s a suggestion – why not treat the centre staff with same sympathy/respect. It won’t be easy – it could threaten their jobs – but try to contact some of the centre ‘job coaches’ (sic) and get their side of the story. I have no doubt there are some over officious types, but then there may be some hard to deal with types on the other side of the bullet proof glass. Perhaps you should put your perfectly sensible suggestion to the public service unions that represent these particular workers, with the suggestion that they start making much stronger representations to them than has hitherto been the case. As for “othering” the police: well, that is hardly a recent phenomenon in the history of class struggle. delighted to know that some are still fighting on behalf of the poor…curious to know how much help/involvement/support from any Labour councillors/MSPs/CLP activists? Are you for real? SLAB are part of the problem. They invented sanctions and welfare assessments as well as the Bedroom Tax. The Tories simply took them to their logical conclusions. SLAB is virtually all Blairite now, it has been hollowed out. Everyone who might have been interested has left and gone to the SNP, RISE, Greens etc. The other answer of course is none of those you mention have any powers over welfare policy or implementation. All that stuff is reserved to Westminster and if you recall almost everyone has an SNP MP and this government is not going to listen to the SNP. You seem to be a refugee from the 1980s. Are there no workhouses? That is a blessing! It is a real eye opener that people can now have “advocates” to help them navigate the system and deal with officialdom. Words keep coming back to haunt us like “better together”, “broad shoulders” of the British state and “pooling and sharing”. It is revealing that the great Gordo does not strut the stage and rail against this welfare iniquity. But, he is now working for global capitalism along with darling and Alexander; the three “brothers” of yesteryear labour. The language used by the authorities – “sanctions” is sub human. This is brilliant, and deserves to be widely read. Thank you. How about becoming an independent country, Scotland?